2017 Update: Apparently, the short answer is yes. Every few days we see more polls about the U.S. election. After a contentious primary season full of polling, we’re now going to be seeing even more polls to tell us who the most likely winner of the actual election in November will be. At this time, the contest seems to be between Hillary Clinton and Donald Trump, with the possibility of some independent and third party candidates making a mark. There are, however, more creative ways to make predictions about the election than simply following the latest polls. You can actually find out a lot about what people are thinking by doing research on the Internet. Let’s look at how unlikely sites such as Fiverr.com (check out top Donald Trump impersonator) may be able to help us predict the election winner. First, we’ll look at a few more traditional options: Google and social media. One of the most obvious places to search for clues regarding candidates’ popularity is the world’s largest search engine, Google. There are many ways you can search Google for evidence, such as searches, news stories and Google Trends. You can definitely find useful information on Google, but you also have to be careful about coming to conclusions. The very fact that many people are searching using a candidate’s name indicates that people are at least interested in this person. This does not, however, always mean that the candidate is popular. As The Economist points out, many people are interested in finding out about scandals connected to candidates. The 2016 election is interesting because the two leading candidates are both surrounded by scandal and controversy. As ABC News reports, Trump and Clinton are the two most disliked nominees in a long time. Many searching on Google are just as likely to be trying to dig up dirt on the candidate they oppose as trying to learn more about the one they support. Google Trends is another tool that can be used to gauge public interest in political candidates. Trends, however, are constantly changing. If you take a look at Google Trends on any given day, you’ll see that it’s dominated by events that are in the headlines, which may include sports scores, celebrity gossip, high profile crimes and political news. You can search on Google Trends for candidates’ names and any stories related to them. This tells you whether interest in the candidate is increasing or decreasing. You can also look at forecasts, to see what Google predicts the search volume will be in the future. For example, based on partial data for June, Hillary Clinton is given a search index of 100, the highest possible number. Searches for Donald Trump, which have declined over the last few months, are indexed at 55. Of course, these numbers could radically change at any time based on new developments. And, once again, searches don’t always correspond to popularity. For example, there are currently rumors that Wikileaks is going to release some extremely incriminating information about Clinton soon. If this happens, search volume for Clinton will rise dramatically, but this will certainly not be a positive sign for her campaign. The 2016 election is sure to be the presidential election most affected by social media. This is simply because social media has been constantly growing over the last few years. Sites such as Twitter and Facebook both affect and reflect what people think about political campaigns and election results. This includes everything from status updates, links to articles, videos and memes. The latter have really grown popular since the last presidential election. Many memes, it’s worth noting, are negative -you can find thousands mocking both Clinton and Trump. With social media, it’s important to recognize that what you see is largely a result of who your friends are and what you post. Most people tend to have friends who share their beliefs, making your own timeline even less accurate in this regard. So reading the links, memes and tweets of people you follow is not an objective way to determine what people are saying nationally. To really find out what people are thinking about the election, you have to look beyond your own timeline and see what’s being said around the country. With Facebook, you can look at trending stories that give you a more universal look at what’s being shared. Another way to measure popularity on Facebook is by likes on pages. This isn’t always a straightforward variable, though, as there are usually many different pages for every cause. With presidential candidates, though, you can look at the top pages. Currently, the page Donald J. Trump has 8.5M likes and the Donald Trump for President page has over 1M likes. By contrast, “only” 4.2M people have liked the Hillary Clinton page, only about half the number as for Trump. The Hillary Clinton for President Supporters page has 500K likes, once again roughly_ half of the similar page for Trump. Bernie Sanders, who appears to have been defeated in the Democratic primary by Clinton, also has quite a few likes: currently 4.5M, which is actually slightly higher than Clinton’s number. These numbers, of course, don’t prove anything about who’s going to win the election, but they do provide some evidence of how Facebook users -an extremely large and diverse demographic, feel about the major candidates. While social media doesn’t give a scientific view of which candidates are most popular, it can certainly be used to get an informal picture of what people are saying. With Twitter, hashtags can go a long way to show what people are thinking. The same is true on Instagram, where hashtags are also widely used. Other ways to gauge popularity on Twitter are measuring the most retweeted tweets. Using the gig site Fiverr.com to predict election results may seem unlikely, but there are actually advantages to this innovative approach. Fiverr is one of the most popular freelancing sites, where you can order gigs on tasks ranging from graphics to voiceovers to copywriting, starting at $5. While many gigs are related to conventional business tasks, there are also many creative and even bizarre gigs as well. You’ll actually find quite a few gigs related to the 2016 presidential candidates. Let’s look at some of these. 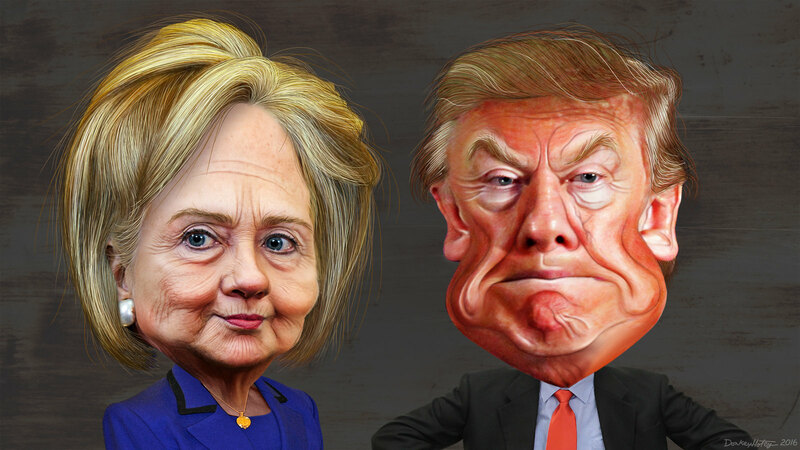 Going by the number of gigs, the most popular political candidate on Fiverr is Donald Trump. Donald Trump may be popular on Fiverr because of his fame as a businessman and TV personality. This makes it appealing and amusing to have him holding a sign to promote a business. Of course, many people order this type of gig just for fun or perhaps as a practical joke. There are also a few gigs by sellers who impersonate Bernie Sanders. Fiverr taps into the quickly expanding gig economy, as more and more businesses rely on freelancers to perform a variety of jobs. Not all gigs are profitable for sellers, but when someone posts a gig consistently and it has a significant number of reviews, you can be sure people are ordering it. That’s why gig sites like Fiverr can be used to estimate a variety of things –such as what kind of tasks people want done, how much people are willing to pay for various services and even seemingly unrelated things such as which presidential candidate is most popular. There’s no surefire way to predict who will win the presidential election. Not even the most supposedly scientific polls are reliable in this regard. Proof of this revealed during the primary season. In several states, Hillary Clinton supposedly had a double-digit lead in the polls over Bernie Sanders but Sanders ended up winning. This is a good reason to not take any type of predictions too literally. Google, social media, gig sites and many other criteria can be used to unofficially measure who is most popular. Google may provide the greatest wealth of data, but it’s not always easy to make sense of it. As we’ve seen, searches and trends are just as likely to be motivated by negative feelings about candidates as positive. Fiverr gigs provide evidence about which candidates inspire the most gigs for actions such as holding signs and voice impersonations. In this case, the clear winner is Donald Trump. Trump also wins the unofficial Facebook poll, at least based on liked pages. Only time will tell whether this proves to be accurate.